Thanks to jbud1980 for suggesting this. It's contest time once again at Curefans.com! With the Las Vegas show rapidly approaching, we're wondering what you think The Cure's set will consist of. Pop classics? A dark dream? Perhaps some b-sides or other oddities? Let us know by selecting up to 35 songs in the order you think they will be played. The staff has come up with a scoring system to determine who made the closest guess. Complicated? Maybe. But hey, the staff is going to be tallying up the scores, not you. And with a contest there should be a prize, right? Well, we've got something pretty cool to award the winner. 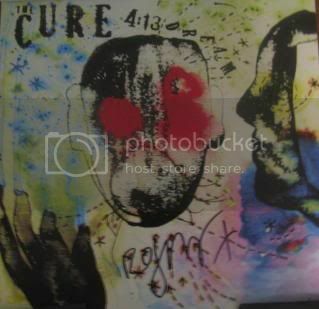 1st place will get a 4:13 Dream lithograph signed by Robert Smith. So please, submit your list here. 1-No more than 35 songs. 2-Place the songs in the order you think they will be played. 3-Please state what you think the total time of the concert will be. This will be used in case there's a tie. Deadline to enter is April 15th. Awesome prizes! I am extremely pumped to win, but best of luck to us all! Here is what I think it will be based on what I have seen on there past lists. 28. why can't i be you? 30. Why Can't I Be You?